This article is about meditation. For other uses, see Samādhi (disambiguation). Samādhi (Tamil: Samādhi சமாதி, Sanskrit: समाधि, Kannada: ಸಮಾಧಿ, Hindi pronunciation: [səˈmaːdʱi]), also called samāpatti, in Buddhism, Hinduism, Jainism, Sikhism and yogic schools refers to a state of meditative consciousness. In the Yogic traditions, and the Buddhist commentarial tradition on which the Burmese Vipassana movement and the Thai Forest tradition rely, it is a meditative absorption or trance, attained by the practice of dhyāna. In the oldest Buddhist suttas, on which several contemporary western Theravada teachers rely, it refers to the development of a luminous mind which is equanimous and mindful. In Buddhism, it is the last of the eight elements of the Noble Eightfold Path. [web 1] In the Ashtanga Yoga tradition, it is the eighth and final limb identified in the Yoga Sutras of Patanjali. Sarbacker: samādhi is meditative absorption, attained by the practice of dhyāna. Diener, Erhard & Fischer-Schreiber: samādhi is a non-dualistic state of consciousness in which the consciousness of the experiencing subject becomes one with the experienced object. Shankman: an abiding in which mind becomes very still but does not merge with the object of attention, and is thus able to observe and gain insight into the changing flow of experience. Paramahansa Yogananda: A soundless state of breathlessness. A blissful super consciousness state in which a yogi perceives the identity of the individualized Soul and Cosmic Spirit. samā, "even"; dhi, "intellect": a state of total equilibrium of a detached intellect. sam, "perfect," "complete." dhi, "consciousness": a state of being where "all distinctions between the person who is the subjective meditator, the act of meditation and the object of meditation merge into oneness." sama, "equanimous" dhi,"buddhi or the intellect"
Common Chinese terms for samādhi include the transliterations sanmei (三昧) and sanmodi (三摩地 or 三摩提), as well as the translation of the term literally as ding (定 "fixity"). Kumarajiva's translations typically use sanmei (三昧), while the translations of Xuanzang tend to use ding (定 "fixity"). The Chinese Buddhist canon includes these as well as other translations and transliterations of the term. The origins of the practice of dhyana, which culminates into samadhi, are a matter of dispute. According to Bronkhorst, dhyana was a Buddhist invention, whereas Alexander Wynne argues that dhyana was incorporated from Brahmanical practices, in the Nikayas ascribed to Alara Kalama and Uddaka Ramaputta. These practices were paired to mindfulness and insight, and given a new interpretation. Kalupahana also argues that the Buddha "reverted to the meditational practices" he had learned from Alara Kalama and Uddaka Ramaputta. The term 'Samadhi' derives from the root sam-a-dha, which means 'to collect' or 'bring together', and thus it is often translated as 'concentration' or 'unification of mind'. In the early Buddhist texts, samadhi is also associated with the term samatha (calm abiding). In the commentarial tradition, samadhi is defined as ekaggata, one-pointedness of mind (Cittass'ekaggatā). Momentary concentration (khanikasamadhi): A mental stabilization which arises during vipassana. Preliminary concentration (parikammasamadhi): Arises out of the meditator's initial attempts to focus on a meditation object. Access concentration (upacarasamadhi): Arises when the five hindrances are dispelled, when jhana is present, and with the appearance the 'counterpart sign' (patibhaganimitta). Absorption concentration (appanasamadhi): The total immersion of the mind on its meditation of object and stabilization of all four jhanas. Samadhi is the last of the eight elements of the Noble Eightfold Path. [web 1] It is often interpreted as referring to dhyana, but in the suttas samadhi and dhyana are not the same. While samadhi is one-pointed concentration, in dhyana this samadhi is used in the initial stages, to give way to a state of equanimity and mindfulness. The practice of dhyana makes it possible to keep access to the senses in a mindful way, avoiding primary responses to the sense-impressions. The Noble Eightfold Path is a condensation of more elaborate descriptions of this path, which starts with a householder who hears the dhamma and leaves home (either literally or figuratively), and after preparatory practices starts with the practice of dhyana. [note 9] The Pāli canon describes eight progressive states of jhāna: four meditations of form (rūpa jhāna), and four formless meditations (arūpajhānas), though the early texts do not use the term dhyana for the four formless meditations, calling them instead āyatana (dimension, sphere, base). A ninth form is Nirodha-Samāpatti. According to Bronkhorst, the four rūpa jhāna may be an original contribution of the Buddha to the religious landscape of India. They formed an alternative to the painful ascetic practices of the Jains. The arūpa jhāna were incorporated from non-Buddhist ascetic traditions. According to Crangle, the development of meditative practices in ancient India was a complex interplay between Vedic and non-Vedic traditions. This problem has been elaborated by several well-known scholars, including Tilman Vetter, Johannes Bronkhorst, and Richard Gombrich. Schmithausen[note 11] notes that the mention of the four noble truths as constituting "liberating insight", which is attained after mastering the Rupa Jhanas, is a later addition to texts such as Majjhima Nikaya 36. Both Schmithausen and Bronkhorst note that the attainment of insight, which is a cognitive activity, cannot be possible in state wherein all cognitive activity has ceased. According to Vetter and Bronkhorst, dhyana itself constituted the original "liberating practice". According to Alexander Wynne, the ultimate aim of dhyana was the attainment of insight, and the application of the meditative state to the practice of mindfulness. According to Frauwallner, mindfulness was a means to prevent the arising of craving, which resulted simply from contact between the senses and their objects. According to Frauwallner, this may have been the Buddha's original idea. According to Wynne, this stress on mindfulness may have led to the intellectualism which favoured insight over the practice of dhyana. Grouped into the jhana-scheme are four meditative states, referred to in the early texts as aruppas. These are also referred to in commentarial literature as immaterial/formless jhānas (arūpajhānas), also translated as The Formless Dimensions, in distinction from the first four jhānas (rūpa jhānas). In the Buddhist canonical texts, the word "jhāna" is never explicitly used to denote them, they are instead referred to as āyatana. However, they are sometimes mentioned in sequence after the first four jhānas (other texts. e.g. MN 121 treat them as a distinct set of attainments) and thus came to be treated by later exegetes as jhānas. The immaterial are related to, or derived from, yogic meditation, and aim more specific at concentration, while the jhanas proper are related to the cultivation of the mind. The state of complete dwelling in emptiness is reached when the eighth jhāna is transcended. eighth jhāna: neither perception nor non-perception (Pali nevasaññānāsaññāyatana, Skt. naivasaṃjñānāsaṃjñāyatana). Although the "Dimension of Nothingness" and the "Dimension of Neither Perception nor Non-Perception" are included in the list of nine Jhanas taught by the Buddha, they are not included in the Noble Eightfold Path. Noble Path number eight is "Samma Samadhi" (Right Concentration), and only the first four Jhanas are considered "Right Concentration". If he takes a disciple through all the Jhanas, the emphasis is on the "Cessation of Feelings and Perceptions" rather than stopping short at the "Dimension of Neither Perception nor Non-Perception". According to Buddhaghosa, in his influential standard-work Visuddhimagga, samadhi is the "proximate cause" to the obtainment of wisdom. The Visuddhimagga describes 40 different objects for meditation, which are mentioned throughout the Pali canon, but explicitly enumerated in the Visuddhimagga, such as mindfulness of breathing (anapanasati) and loving kindness (metta). Several western teachers (Thanissaro Bhikkhu, Leigh Brazington, Richard Shankman) make a distinction between 'sutta-oriented' jhana' and 'Visuddhimagga-oriented' jhana. Thanissaro Bhikkhu has repeatedly argued that the Pali Canon and the Visuddhimagga give different descriptions of the jhanas, regarding the Visuddhimagga-description to be incorrect. Keren Arbel has conducted extensive research on the jhanas and the contemporary criticisms of the commentarial interpretation. Based on this research, and her own experience as a senior meditation-teacher, she gives a reconstructed account of the original meaning of the dhyanas. She argues that jhana is an integrated practice, describing the fourth jhana as "lucid awareness," not as a state of deep concentration. The earliest extant Indian Mahayana texts emphasize ascetic practices and forest dwelling, and absorption in states of meditative oneness. These practices seem to have occupied a central place in early Mahayana, also because they "may have given access to fresh revelations and inspiration." Indian dhyana was translated as chán in Chinese, and zen in Japanese. Ideologically the Zen-tradition emphasizes prajna and sudden insight, but in the actual practice prajna and samādhi, or sudden insight and gradual cultivation, are paired to each other. Especially some lineages in the Rinzai school of Zen stress sudden insight, while the Sōtō school of Zen lays more emphasis on shikantaza, training awareness of the stream of thoughts, allowing them to arise and pass away without interference. Patanjali's system is unthinkable without Buddhism. As far as its terminology goes there is much in the Yoga Sutras that reminds us of Buddhist formulations from the Pāli Canon and even more so from the Sarvastivada Abhidharma and from Sautrāntika." "Joy" and "I-am-ness" [...] must be regarded as accompanying phenomena of every coginitive [ecstacy]. The explanations of the classical commentators on this point appear to be foreign to Patanjali's hierarchy of [ecstatic] states, and it seems unlikely that ananda and asmita should constitute independent levels of samadhi. Dharana. In dharana, the mind learns to focus on a single object of thought. The object of focus is called a pratyaya. In dharana, the yogi learns to prevent other thoughts from intruding on focusing awareness on the pratyaya. Dhyana. Over time and with practice, the yogin learns to sustain awareness of only the pratyaya, thereby dharana transforms into dhyana. In dhyana, the yogin comes to realize the triplicity of perceiver (the yogin), perceived (the pratyaya) and the act of perceiving. The new element added to the practice of dhyana, that distinguish it from dharana is the yogi learns to minimize the perceiver element of this triplicity. In this fashion, dhyana is the gradual minimization of the perceiver, or the fusion of the observer with the observed (the pratyaya). Samadhi. When the yogin can: (1) sustain focus on the pratyaya for an extended period of time, and (2) minimize his or her self-consciousness during the practice, then dhyana transforms into samadhi. In this fashion then, the yogin becomes fused with the pratyaya. Patanjali compares this to placing a transparent jewel on a colored surface: the jewel takes on the color of the surface. Similarly, in samadhi, the consciousness of the yogin fuses with the object of thought, the pratyaya. The pratyaya is like the colored surface, and the yogin's consciousness is like the transparent jewel. Sahaja samadhi is a state in which a silent level within the subject is maintained along with (simultaneously with) the full use of the human faculties. Sahaja is one of the four keywords of the Nath sampradaya along with Svecchachara, Sama, and Samarasa. Sahaja meditation and worship was prevalent in Tantric traditions common to Hinduism and Buddhism in Bengal as early as the 8th–9th centuries. 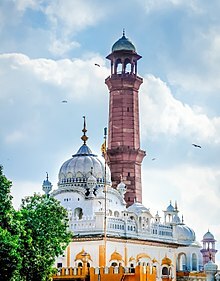 The Samadhi of Ranjit Singh is located next to the iconic Badshahi Masjid in Lahore, Pakistan. "Night and day, they ravish and enjoy the Lord within their hearts; they are intuitively absorbed in Samadhi. ||2||" (p. 1259)[clarification needed]. According to Stuart-Fox, referring to Rhys Davids and Stede, when vitarka-vicara are mentioned in tandem, they are one expression, "to cover all' varieties of thinking, including sustained and focused thought. It is thinking in this inclusive sense that the meditator suppresses through concentration when he attains one-ness of mind and thus moves from first to second jhana." ^ a b Upekkhā is one of the Brahmaviharas. "When a monk has developed and pursued the five-factored noble right concentration in this way, then whichever of the six higher knowledges he turns his mind to know and realize, he can witness them for himself whenever there is an opening...."
"If he wants, he wields manifold supranormal powers. Having been one he becomes many; having been many he becomes one. He appears. He vanishes. He goes unimpeded through walls, ramparts, and mountains as if through space. He dives in and out of the earth as if it were water. He walks on water without sinking as if it were dry land. Sitting crosslegged he flies through the air like a winged bird. With his hand he touches and strokes even the sun and moon, so mighty and powerful. He exercises influence with his body even as far as the Brahma worlds. He can witness this for himself whenever there is an opening ..."
^ theravadin.wordpress.com: "In this order, therefore, what we should understand as vipassanā is not at all a synonym for sati but rather something which grows out of the combination of all these factors especially of course the last two, samma sati and samma samādhi applied to the ruthless observation of what comes into being (yathābhūta). One could say, vipassanā is a name for the practice of sati+samādhi as applied to anicca/dukkha/anatta (i.e. generating wisdom) directed at the six-sense-process, including any mental activity." According to Gombrich, "the later tradition has falsified the jhana by classifying them as the quintessence of the concentrated, calming kind of meditation, ignoring the other - and indeed higher - element. ^ See Louis de La Vallée Poussin, Musial and Narad. Translated from the French by Gelongma Migme Chödrön and Gelong Lodrö Sangpo. ^ Gomez & Silk: "This samadhi is at the same time the cognitive experience of emptiness, the attainment of the attributes of buddhahood, and the performance of a variety of practices or daily activities of a bodhisattva—including service and adoration at the feet of all buddhas. The word samadhi is also used to mean the sūtra itself. Consequently, we can speak of an equation, sūtra = samādhi = śūnyatā, underlying the text. In this sense the title Samadhiraja expresses accurately the content of the sūtra." ^ Yoga Sutra 1.17: "Objective samādhi (samprajnata) is associated with deliberation, reflection, bliss, and I-am-ness (asmita). ^ Yoga Sutra 1.42: "Deliberative (savitarka) samapatti is that samādhi in which words, objects, and knowledge are commingled through conceptualization." ^ According to Jianxin Li, Asamprajnata Samādhi may be compared to the arupa jhanas of Buddhism, and to Nirodha-Samapatti. Crangle also notes that sabija-asamprajnata samādhi resembles the four formless jhanas. According to Crangle, the fourth arupa jhana is the stage of transition to Patanjali's "consciousness without seed". ^ a b Sarbacker 2012, p. 13. ^ "The eight limbs, The core of Yoga". Expressions of Spirit. ^ "8 Limbs of Yoga: Samādhi". families. ^ Diener, Erhard & Fischer-Schreiber 1991. ^ Yogananda, Paramahansa (2014). Autobiography of a Yogi (13th ed.). Self-Realization Fellowship. p. 123. ISBN 978-0-87612-079-8. ^ Sturgess, Stephen (2014). Yoga Meditation. Oxford, UK: Watkins Publishing Limited. p. 27. ISBN 978-1-78028-644-0. ^ a b c d e f g h i j k l Bronkhorst 1993. ^ Bronkhorst 1993, p. 63. ^ "Suttantapiñake Aïguttaranikàyo § 5.1.3.8". MettaNet-Lanka (in Pali). Archived from the original on 2007-11-05. Retrieved 2007-06-06. ^ Bhikku, Thanissaro (1997). "Samadhanga Sutta: The Factors of Concentration (AN 5.28)". Access to Insight. Retrieved 2007-06-06. ^ a b c d e Vetter 1988. ^ a b c d Bucknell 1993, p. 375-376. ^ Stuart-Fox 1989, p. 82. ^ a b c d Wynne 2007, p. 106. ^ Crangle 1994, p. 267-274. ^ a b c Gombrich 1997. ^ Bronkhorst 1993, p. 133-134. ^ a b Schmithausen 1981. ^ a b Vetter 1988, pp. xxi-xxii. ^ Vetter 1988, pp. xxi-xxxvii. ^ a b Wynne 2007, p. 105. ^ Williams 2000, p. 45. ^ Buddhaghosa & Nanamoli 1999, p. 437. ^ a b Quli 2008. ^ Williams 2008, p. 30. ^ Skilton 2002, p. 56. ^ a b Gomez & Silk 1989, p. 15-16. ^ Hui-Neng & Cleary n.d.
^ Werner 1994, p. 27. ^ Thurman 1984, p. 34. ^ Farquhar 1920, p. 132. ^ a b c d e Forman 1999, p. 6. ^ a b What is Liberation According to the Teachings of Sri Ramana Maharshi? Look up samadhi in Wiktionary, the free dictionary.